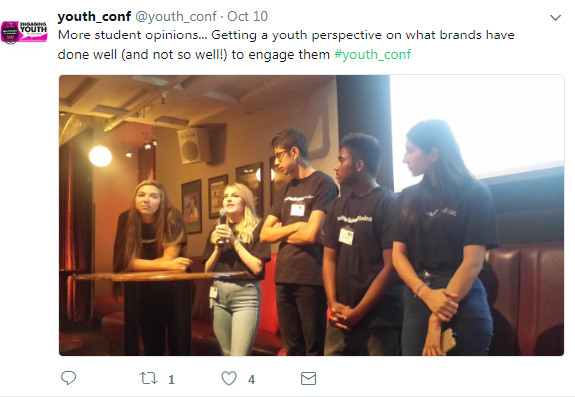 The National Student hosted a panel at the Engaging Youth Conference and we've written up our student responses to the marketer's questions. It’s no secret that the digital world is revolutionising marketing. Moreover, these changes are happening at breakneck speed and young people are in the driving seat. The annual Engaging Youth Conference brings together brands, agencies and Universities to discuss the latest trends in marketing and the most successful ways to engage a young audience. This year, the venue was Bounce in Farrington – where ping pong was actually invented – and there was an abundance of pizza. Throughout the day there were scheduled talks from market leaders. We heard Rob Scotsman, from Pandora, discuss his success using influencers to engage younger generations. In another talk, Lauren Smith, from Cosmopolitan, warned against carbon copying content from one social platform to another because the consumer demands are different on each platform. There were also peer-to-peer discussions about how education providers can engage students specifically and social media etiquette for Universities. It was a varied, informative and illuminating day. Q: What platform do you use the most? Instagram and Snapchat were quoted the clear favourites. One student made the declaration that Facebook is dead and that many of their friends had deleted it from their phones. Another discussed how Twitter had become more of a professional ‘show’ and not about personal social interactions any more. Many students make separate Twitters for different purposes – one even had an account that was purely for entering competitions! The students also relayed a growing trend for podcasts because it is seen as a more productive use of their time than listening to music. Often recommendations for these come from friends and word of mouth, rather than online. Q: What would make you interact with a brand? Would a competition work? The students seemed reluctant to give e-mails out, but did not have an issue with tagging their friends in Facebook posts for a competition. It’s seen as more of a conversation starter. Handing over an e-mail address, however, is seen as a deal breaker the majority of the time because their inboxes are already brimming with spam. Q: Would young influencers change your perception of a traditionally ‘older’ brand? E.g NEXT clothing brand. The students agreed that an influencer would be effective in changing perceptions, especially if it was someone that was relatable, inspirational and had built a name for themselves in the relevant field – they used bloggers as an example. They separated these people from typical celebrities. Some of our students said the rich and famous aren’t relatable because of their extravagant lifestyles and therefore it perhaps wouldn’t encourage them to perceive a brand as ‘younger’. Also, they reported that they would be more likely to engage with something that was on the influencer’s own social media platforms, rather than a campaign that was done on the brand’s channel. Q: Have young people built up immunity to clickbait? Students can easily identify what they termed ‘trash’ content and clickbait. However, they stated that occasionally they do enjoy this variety of content – it is quick, easy to consume and often humorous. The majority of the time students are on social media to be entertained and clickbait can meet this need. Q: Is the eight second filter true? According to the responses of our panel, this is too much of a generalisation. There is a stereotype that younger generations have an incredibly short attention spans and a desire for immediate gratification. Whilst one student openly admitted that his filter is probably less than eight seconds, others stated that they are interested in reading and writing and therefore are likely to spend more time skimming over a post on social media. Q: What advice would you give to smaller companies trying to engage a youth audience? Firstly, the students stated that companies should be diverse. They want to live in an equal world and companies should reflect these values. They also advised companies to “act how they are” – i.e, be true to their brand voice. Some companies are luxury; others are cheeky, others are intelligent. All of these are fine. What’s most important is that the voice stays in line with the brand’s ‘character’ because otherwise the experience is jarring for the customer. Give discounts – students love a freebie! Word of mouth will get you everywhere. Q: You’re often described as an ‘altruistic generation’ – do you agree? What makes you want to engage with causes? One student commented that this was an excellent question to be asked. Students do care about causes on an individual basis; just like everyone else they choose charities based on personal experiences and passions. However, they did reveal they would be much more likely to buy a product in aid of something rather than donate money. They acknowledge that this is a delicate balance because if the cost rises too much then it will deter students from buying! Q: We have little money and resources. Do you have any tips on engaging students with mental health issues? Mental health is extremely important amongst students. When a company has little money, our panel suggested trying something creative like an arty Instagram account. It’s crucial to make the posts memorable and this way it is more likely that they will be shared. Another option is to use young people as your advertisers, especially as it is an issue that many young people are engaged with. Q: How should Universities market their content? Universities need to be aware of their purpose in their marketing. Be approachable, but it’s important to avoid being too ‘down with the kids’ – it’s simply cringy. One student reported that her University page is slick, professional and maybe even boring. However, this is exactly how she likes it because it feels appropriate and it is functional. The conference was filled with insightful and inspiring talks and other industry leaders from the likes of BBC Sport, L’Oreal and Lincoln University revealing the inner workings of their marketing strategies. Our team thoroughly enjoyed hosting the student panel and allowing our students to have their voices heard in the world of branding and marketing. To see more of the discussions, check out the #youth_conf hashtag on Twitter or visit www.youthmarketingconference.com.